An ordanary bill is borrowed from a spectator (anny nomination, any curensy) Bill is plased on the macicians hand sundely the bill stars to move, it will slowly start spinnig and will stop att your comand . The bill is then given back to the spectator. 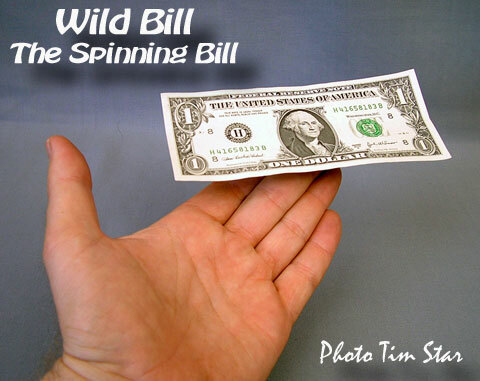 Here is a new version of the spinning bill. Using only one hand. A Bill is borrowed from a spectator, any size or any curansy. The bill is placed in the magicians hand and sudenly the bill starts to spinn and lwill stop at your comand. The gimmick is made of copper and brass Not plastic! And it will last forever. You kan also make other spinn in the same manner like a playing card, buissnis card or even a coin. Just imagine you are about to give someone your business card and just before you do so you will make it spin and it appears to float in your hand.